paint their faces and CREATE! 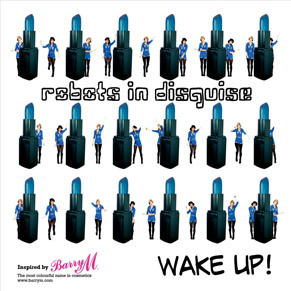 ‘Wake Up!’, an instantly catchy psychedelic pop-punk stomper (produced by Yo Majesty’s David Alexander) was inspired when Dee and Sue saw a TV ad for Barry M with the tagline, “Wake Up your Make Up!”. Lending their electro-pop-indie-rock custom to the likes of the cosmetic industry in response to a TV ad Barry M had screened with the tagline, “Wake Up your Make Up”, Sue Denim and Dee Plume set out on a quest to represent their new trademark. With their kaleidoscopic style, rhythmic quirks and befitting fervor for the Barry M make-up brand, the duo pitched to the team at Barry M cosmetics the Robots’ plans to write a song in their honour. Having initiated this new relationship, the cutting-edge collaboration of beauty product and record release saw Barry M reciprocating with their very own enterprise; introducing a new lipstick to their beauty range, in a particular shade of royal, new Robot, blue. Sue Denim said of the new song – “Wake Up! Is an anthem to creativity and self-expression for all – including being artistic with makeup!”. Watch the new Wake Up! video here. & the video is awesome. I am just far too excited for this single to come out! Amazing song. Amazing video. Amazing band. Amazing make up. great song! great energy! i wanted to be up there singing with them! I do love this song, kind of a lot. Kinda reminds me of early B-52′s, DANCE THIS MESS AROUND! Love the new song and video! I can’t wait to hear more!